Everybody knows that episode of The Simpsons where they get the Pierce Brosnan voiced super house that does everything for them, making life a breeze. Well as technology gets smarter and smarter this fantasy home is quickly becoming a reality and in fact you can already purchase plenty of advanced home wares capable of auto tasking themselves to suit and simplify your life. Oh and did I mention these ones aren’t homicidal? These days we want everything to be smart and connected from our televisions to our pot plants. Did you know that since 2008 there are more inanimate objects connected to the net than people and this number grows exponentially each year? Off course I could sit here for hours writing about all the awesome smart gadgets your house needs right now but that would just make me sad because I can’t afford them. What I am really interested in discussing though, is the impact of the Internet of Things (IoT) on the retail industry. “In simple terms, the IoT stands for the connection of usually trivial material objects to the internet … At the very least, this connectivity allows things to broadcast sensory data remotely, in the process augmenting material settings… In most cases these objects are able to store and process information, as well as independently initiate action” (Teodor Mitew). Currently I work part time at my local IGA and every day that I walk up and down the isles checking the dates for expired products and writing down what stock needs to be re ordered on my little note pad, I think to myself, ‘for the love of God isn’t there some kind of automated system that could be doing this?’ While I’m working I daydream constantly about a world where each product is scanned before being put on the shelf and I can receive notifications about when it will go bad or when the stock is running low. But that is just thinking about the benefits at a very fundamental level, there are so many more insights that can be gained from a connected grocery store. Food retail is unique in that it has a substantial components most other retail environments don’t have. For example the food’s freshness is relative to time and temperature whereas clothing retailers do not have to worry about that issue. Imagine a store where the fridges detected and automatically adjusted themselves after scanning the temperature of individual products, imagine digital price tags that updated themselves in real time according to daily specials. “Through implementing an effective Internet of Things strategy, retailers can significantly improve, automate and refine business processes, reduce operational costs, integrate channels and better understand consumer trends” (Hussmann). Again there are so many more benefits to a connected store, this whole time I have only been discussing the benefits for me, the worker, but what about the customer? 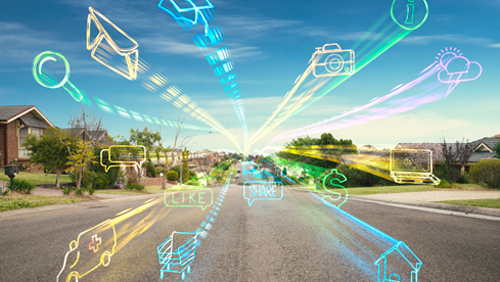 The Internet of Things means that customers can interact with the products on a deeper level. Smart trolleys have the potential to record highly specific data about an individual’s shopping habits. From there it can suggest products they are likely interested in, auto generate a shopping list based on previous purchases, show them the location of things in the store, tally the cost as they go and assist with budgeting, organise meal plans and even offer unique discounts or promotions. Imagine if quick a smart phone scan of any bar-code gave you recipes, reviews and a dietary rating, well you don’t have to imagine for too long because these are technologies that already exist and are on the cusp of widespread integration. In this week’s lecture I was introduced to ‘The Conscience of a Hacker’ a manifesto written by hacker called +++The Mentor+++ in 1986. Reading it I couldn’t help but be reminded of the ‘The Cyberpunk Manifesto’ written by Christian Kirtchev in 1997. I took the liberty of chopping a few bits of each to highlight their similarity. This is our world now, the world of the electron and the switch, the beauty of the baud… We make use of a service already existing without paying for what could be dirt-cheap if it wasn’t run by profiteering gluttons, and you call us criminals. We explore and you call us criminals. We seek after knowledge and you call us criminals. You build atomic bombs, you wage wars, you murder, cheat, and lie to us and try to make us believe it’s for our own good, yet we’re the criminals…You may stop this individual, but you can’t stop us all- after all, we’re all alike. We are the ELECTRONIC MINDS, a group of free-minded rebels. We live in Cyberspace, we are everywhere, we know no boundaries. We are those, the different. Technological rats, swimming in the ocean of information… We are the student hacking computer systems, exploring the depth of his reach…Our society is sick and needs to be healed. The cure is a change in the system… We fight for freedom of information. We fight for freedom of speech and press…. We are a unit. We are Cyberpunks. This was my first time reading ‘The Conscious Hacker’ but ‘The Cyberpunk Manifesto’ is something that I have read countless times before as I am obsessed its anarchist undertones and the idealistic sense of freedom it promises. After looking at the two comparatively it really made me notice how hacking is so closely tied to cyberpunk ideologies. In cyberpunk novels the outcast anti-hero inevitably breaks all the rules in order to take down the evil establishment and save the world from its villainous clutches. 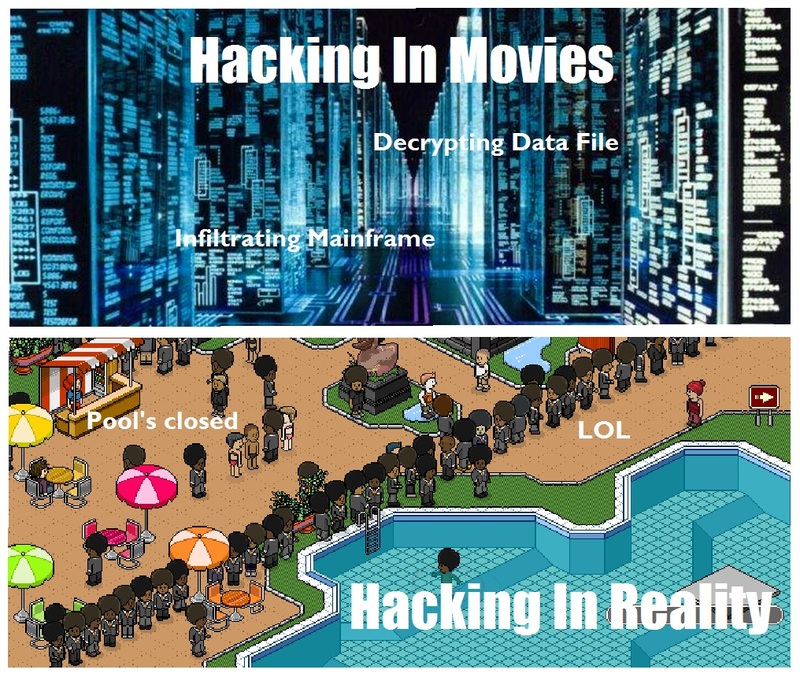 While this is an epic perception of hacking that after watching films like Hackers and shows like MR Robot I so desperately want to be true, I have to ask myself, can the act of hacking ever be as justified as it is in cyberpunk works of fiction? Can the real world be broken down into black and white simplifications of heroes vs villains? Is there really such a thing as Hacktivism? So this week I set out to determine what the ethical perspectives of hacking are. There are those that see hacking as a way of standing up for injustices and liberating people from imposed censorship. This act of hacking is seen as justified by the perpetrators as they believe the censorship is unfairly enforced and therefore a law that deserves to be broken. An example of this would be the collaboration between The Cult of the Dead Cow and The Hong Kong Blondes who launched attacks against the Chinese government to protest government censorship of Internet content. They compromised a firewall system in China, allowing Internet users in that country unrestricted access to the Web for a brief period of time and they also defaced several Chinese governmental websites. Hacktivism is often confused with cyberterrorism but a boundary between the two can be drawn depending on one’s definition of ‘damage’. It is important to remember that not all hacking involves breaking into systems, spying or even damaging data. Hacktivisim can be as simple as a denial-of-service attack where all that occurs is a mass volume of people generate so much traffic on a website that it crashes and no legitimate users can access it. This type of hacking is seen as a mere extension civil disobedience into the internet realm. “Civil disobedience entails the peaceful breaking of unjust laws, it does not condone violent or destructive acts against its enemies, focusing instead on nonviolent means to expose wrongs, raise awareness, and prohibit the implementation of perceived unethical laws by individuals” (Manion & Goodrum). In this instance the hackers see no difference between this and picketing in the street to deny people access to a building. “Activists here are attempting to bring about social change through non-violent means; whereas activists in the past trespassed and blockaded physical positions of power, hacktivists now would seize control of the new positions of power—cyberspace—and without all those nasty guns, water cannons, dogs, billy clubs and tear gas” (Julie Thomas). There are those however who believe denial-of-service attacks to be against the hacker code because they themselves are a form of censorship and violate the right to free speech- which in the true roots of the hacker culture is a fundamental law that must never be broken (even if it is against your enemies). One of the world’s most famous hackers who believes whole heartedly in this ideal is Julian Assange, he has no qualms about sneaking into closed systems and revealing private information but does not believe in the destruction of information in any way. Assange is practically a pure personification of the old school hacker mentality in that he is a utilitarian extremist who promotes the total transparency of information. To him, his actions are justified because as all information should be free regardless of consequence. What people chose to do with the information does not change the fact that it should not be kept hidden. Absolute truth is the only moral decisional direction. In the end the ethics of hacking all comes down to the age old question of does ends justify the means? While different hackers have different codes of ethics and different definitions of damage, every act is circumstantial and instead of being broken down into wright and wrong should be judged in term of what was stood to be gained and at what cost? “As the use of mobile phones in public spaces is increasing, it is leading to the change in social order by blurring the boundary between public and private spaces. What one would typically call a public place is slowly becoming pockets of individual private spaces where people exhibit behaviors as if they were by themselves’” (Geiger 2013). What we are seeing is a world where people are always on, always connected to the decentralized global network and this is creating an environment where there is no barrier between real the world and online world. We take our mobiles everywhere, we work from home and we take our social medias into the office. Some of us don’t even have an office, working from companies that exist entirely in the digital realm providing services that run on the facilitation of information rather than the providing of physical products. This is the liquid labour environment and I discuss in my podcast above it is extremely flexible and constantly moving. We are both the consumers and the creators, the customers and the product. Are we more accepting of new technology? What kind of fears do we have regarding our current technologies? Do we still have a dystopian view of the future or do we have more positive perceptions? Is there room for the cyberpunk genre to re-emerge in our modern culture? And if so how might it be different? 35% of participants stated they had a negative perception of the future in that they think we are headed towards disaster rather than utopia. This actually contradicts what I had hypothesized. I thought for sure there would be a positive trend in perceptions but the survey showed that the majority had a bleak, dystopic view, reminiscent of classic cyberpunk. But then when asked what their perception of cyber technologies was, 50% said helpful and 24% said extremely helpful. Only 6% said they thought cyber technology was dangerous showing a vast drift towards positive perceptions and suggesting a greater acceptance of technological advancement. When asked their level of fear over technological advancement 50% said not very frightened and 11% said not frightened at all. Only 3% said very frightened again showing a greater acceptance of technology and a low level of cyber related fear. However, there were still areas of cyber culture that generated anxiety within the respondents; predominantly in the field of Artificial Intelligence. When asked if there were any current or near future technologies they were particularly worried the most common answer was Artificial Intelligence. Answers Ranged from AI’s killing or enslaving us, to unemployment from AI’s flooding the job market, to the ethics of playing god. Others were concerned about their online privacy, online security, drone spying, governments control through wearable technology and social media dependency. The three issues most concerned about were Cyber Terrorism, Online Privacy and Cyber Security. From this I have gathered fear is still prevalent when it comes to our perceptions of new technologies and there is growing concern over several key issues. Due to a lot of mentioning of films in people answers though I have begun to re-shape my thinking in that perhaps it is not people’s fears that shape cyberpunk films but rather films that shape peoples cyber fears. The last two weeks I have been conducting a literature review to see what I could find about the existence of cyberpunk today. My first research objectives was to get a clear definition of what cyberpunk is, so I could create some sort of criteria for examining modern texts. I came to the consensus that cyberpunk can be defined as the intersection between science fiction and postmodernism. It is a type of science fiction that deals with real world technologies and near futures and sets them against a cyber-fantasy backdrop. “Cyberpunk is the integration of technology and literature in a world where the gap between science fiction and reality is rapidly closing” (Guven 1995). My next objective was to delve into the debate that cyberpunk as movement is over. Bruce Sterling proclaims that cyberpunk is dead because it has become restrained, commercialized, and mimetic. According to him the respected benchmarks’ of cyberpunk no longer offer, “spontaneous back-flips and crazed dancing on the tables”. The settings come closer and closer to the present day, losing the fantasy (Sterling 1998). Finally using my check list I set out to find any modern day examples of cyberpunk and not just in films and novels but in clothing, music, games and real life people. Guven, S 1995, ‘The Future in Cyberpunk’, Computer Writing and Research Lab, University of Texas, Austin. Kelly, J & Kessel, J 2007, Rewired: The Post-Cyberpunk Anthology, Tachyon, San Francisco. Sterling, B 1998, Cyberpunk In The Nineties, Interzone, viewed 25 March 2016, <http://lib.ru/STERLINGB/interzone.txt&gt;. My favourite movies are Sci-Fi, but more specifically Cyberpunk is my favourite sub-genre of Sci-Fi. Movies like Blade Runner with brooding, gun toting, outcast protagonists and not so far off futures saturated with super advanced mundane technologies, urban decay, power balances and oppression. Lately I have noticed that there aren’t a lot of new movies like this, unless they are reboots of pre-existing movies. This got me thinking about why this may be the case. Is it simply because the trend is over? Just like fashion trends, movies have always come in waves, that are hot one minute and then gone the next; the current trend being Super Hero Action Blockbusters. I can’t help but think however, that it could be more to do with the idea that Cyberpunk as a genre formed as a result of man’s fear of technology. Cyberpunk is always set in a near future where technologies that exist at the time are being used in a way that threatens the survival the lower to middle class everyday people. Could it be that we have somehow become less fearful of technology growing up alongside it? We are currently living in an age where technology advances so quickly, we become complacent to it, unimpressed by it and accepting of it. We are also living in the future described by cyberpunk writers of the past, the technologies are real so it’s not exciting or fantastical anymore. We have a clearer idea of where our future is headed already having tapped into Artificial Intelligence, 3D Printing and Virtual Reality. Could it be that cyberpunk movies a disappearing because we have a greater grasp of cyber culture? What I intend to examine for my research project is the idea of modern day Cyberpunk. I want to form a clear definition of what cyberpunk actually is as both a genre and a culture and I want to pose the question ‘can cyberpunk exist today’ and if so what kind of dystopian visions do we hold for our current technologies? To do this plan to look at recent texts and hold them against a set of cyberpunk criteria. I return again this week after having another conversation with my Uncle Kenny. This time we move beyond the introduction of Television and take a look into the near technological future that is the National Broadband Network (NBN) or as I like to call it the Fiber-Optic-Internet-Utopia. As I am sure it will be made obvious by the end of this post, I am a firm supporter of the NBN and believe that Australia should have started laying out fiber-optic cables direct to the home years ago. While there are many debates circulating over the necessity of such an expensive endeavor, I feel it cannot be denied that our current copper wire network is already outdated and stands no chance of adequately supporting our future internet usage. I worry Australia will fall behind the rest of the world, in terms of speed and connectivity, which will ultimately isolate us from the interconnected age of opportunity. It was interesting to discuss this with my uncle because although he feels the same way about the inadequate nature of the current copper network and understands the level of improvement a fiber-optic network would bring, he, unlike myself, is entirely indifferent to it. While I wait anxiously for progress (despite the fact roll-out hasn’t even started in my area), he is completely un-phased. To be honest, before doing some research of my own this week, I was unaware of what the NBN actually was but I was still passionate about it. All I knew is that I desperately wanted a faster internet connection, so I could finally play my Xbox without lag and stream movies without screaming at my laptop. Anything that promised an end to this first world torment was good enough for me. My Uncle on the other hand knew everything there was to know about NBN and fiber optic cables; including how they worked (which he explained to me against my will). The simplest way he put it was “NBN is like a super highway while copper wire is like a dirt road”…“the dirt is fine when only a few people use it, but once you get everyone driving at once, it’s just too small and eventually it starts to decay”. He told me that the copper wires are already in a bad state and will continue to need constant maintenance which is going be costly in the long run. “This is why”, he states, “the NBN is a far better option to Liberals ridiculous Node system”. I asked him what he thought the future held with the introduction of high speed internet and he replied “Major business and economic change” as well as “change in our everyday lives”. Asking him what he meant by this, he gave me some examples such as: connecting in real time with people around the world, sending and receiving large amounts of data instantly, having an all in one home entertainment/internet system that used voice command, controlling your appliances when your away from home and even doctors operating on patients through specialized equipment from miles away. From these examples I was under the impression Kenny felt a new internet age was a good thing, he had positive images of the future similar to my own. I soon discovered I was wrong. After questioning him about how he expected his internet usage at home to change, he informed me that he didn’t have the internet at all. I was surprised by this, never letting it cross my mind that someone in this day and age lived without the internet. When I asked him why he said it was because “With everything you gain you there is something to loose”. He went on to tell me a story about how his job on the railway was impacted upon by improving technologies. “You used to walk into work and say high to everyone, but now there is nobody there”… “Systems are controlled via satellite from a central operating box”… “There is no social interaction”. He said he felt as though people now days were losing the art of conversation “instead of talking to one another young people are putting in ear phones and looking at their screens”. Perhaps it is just a generational thing but I am inclined to disagree with some of his statements. It is my opinion that younger generation isn’t losing the art of conversation but rather changing the way in which they communicate. It’s true I always check my phone but this is because I am in constant contact with my friends, and although we are not physically talking face to face, there isn’t a day that goes by where we don’t communicate. The point of this blog however, is not to sit here and debate the dangers of internet v’s the benefits, but rather to make comment on the way exposure shapes perception. Am I predetermined to embrace a technological future because of the internet dependent age I have grown up in? Is my uncle so against an online culture because he can remember a time before the World Wide Web? Are our beliefs on the matter of NBN shaped by our own personalities or are we merely subjects of our times? It’s the age old question of nature v’s nurture. Boyd, D 2014, It’s Complicated the Social Lives of Networked Teens, Yale University Press, New Haven, London. National Broadband Network (NBN) 2007-2013, 2013, Whirlpool, viewed 24 August 2014, <http://whirlpool.net.au/wiki/nbn#nbn_evidence&gt;. NBN MYTHS, 2010, What do the Experts Say?, NBN Myths: Debunking the FUD on the NBN, weblog post, 26 September, viewed 24 August 2014, <http://nbnmyths.wordpress.com/what-do-the-experts-say/&gt;. NBN MYTHS, 2010, Top Ten NBN Myths Debunked, NBN Myths: Debunking the FUD on the NBN, weblog post, 26 September, viewed 24 August 2014, <http://nbnmyths.wordpress.com/&gt;. Learn About the NBN, 2014, NBNco, viewed 24 August 2014, <http://www.nbnco.com.au/about-the-nbn.html#.U_mq4WPY9ek&gt;. Wyres, M 2011, Alan Jones and the NBN Fail!, MichaleWyres.com, weblog post, 25 May, viewed 24 August 2014, <http://michaelwyres.com/2011/05/alan-jones-and-the-nbn-fail/&gt;.